The men of the Lewis and Clark Expedition saw many natural curiosities during their trek to the Pacific Ocean. On August 24 Captain Clark described "a blue Clay Bluff of 180 or 190 feet high. . . . Those Bluffs appear to have been laterly on fire, and at this time is too hot for a man to bear his hand in the earth at any debth." The bluff came to be known as the Ionia Volcano. Not until about 1900 did scientists learn that the heat was generated by the oxidation of shale. The bluff has since eroded into the Missouri River. On August 25, from their camp due north of here, Lewis and Clark left the expedition briefly to view a conical hill, which according to Indian legend was "a place of Deavels...they are in human form with remarkable large heads and about 18 inches high." This hill, called Spirit Mound today, is located about eight miles north of Vermillion, South Dakota. 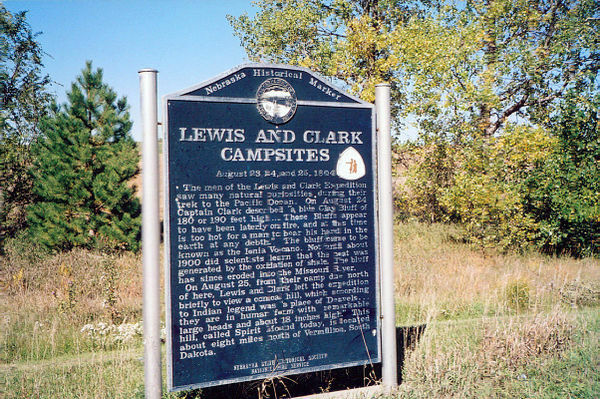 “Lewis and Clark Camp Sites: Aug 23-25, 1804,” Explore Nebraska History, accessed April 19, 2019, https://mynehistory.com/items/show/154.